I have an obsessive love of arugula, and I just added watercress to that greens obsession. 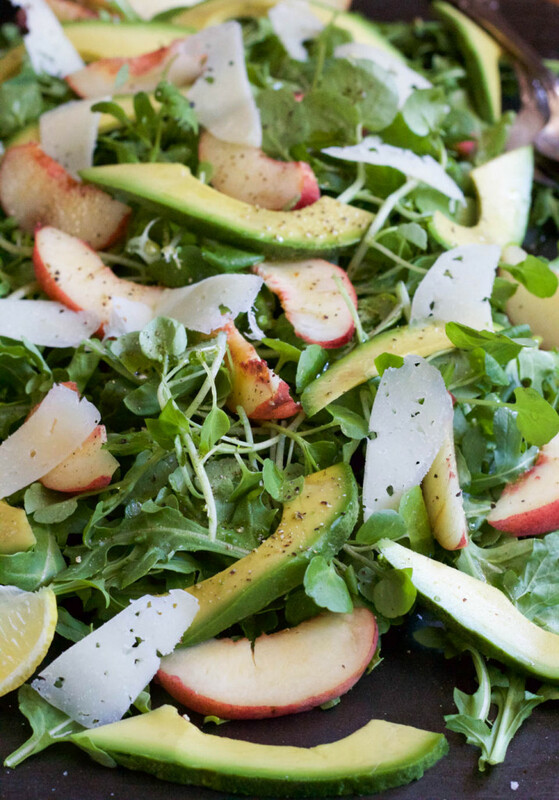 I have eaten it so many times, but I had the best watercress salad in New York a couple of months ago, and it inspired this gorgeous Avocado Peach Manchego Salad! It was a super simply dressed side salad, and I wanted to dress my version up just a bit. 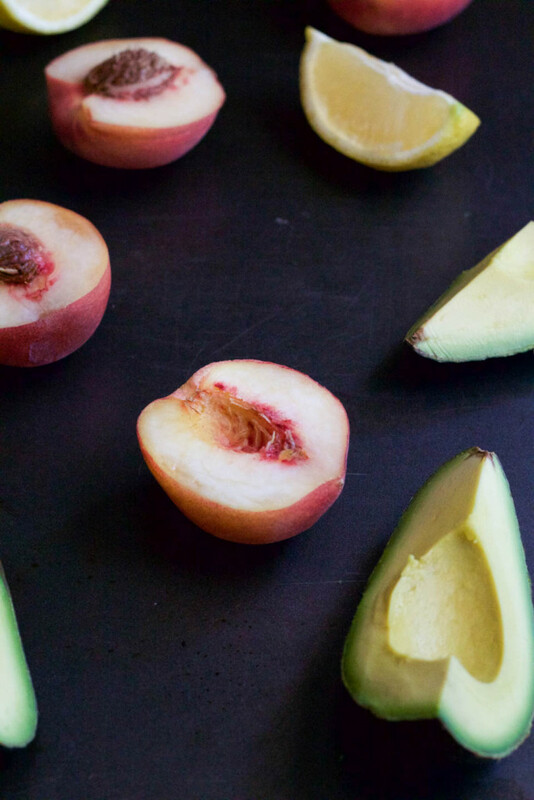 It’s crazy beautiful Ca avocado season, the peaches are sweet and juicy, pretty much to die for, and Manchego cheese tastes good on everything. Even a shoe, it’s that good. It’s a fresh ode to Summer and it’s gorgeous bounty. I’m super duper excited because I’m going to the Bay to see the one and only Grateful Dead tomorrow!!!!! About twenty years ago I went to several shows with my brother and his friends. I was a freshman in high school, and my Mama said I could go with my brother. Her and her friend waited in the parking lot for us, which is comical. I wish I had a picture of them in the parking lot. They are the cutest little Mexican ladies ever! Picture two short, happy Mexican ladies walking the parking lot filled with hippies, nag champa, and dead heads in happy land. Having that support for the music we loved was priceless. We went to shows in Sacramento and Shoreline in the Bay area, I remember them so well. I also remember my homemade tie dyed converse, and flowy dresses. I still have all of my Grateful Dead shirts and Birkenstocks from that time in my life! Fast forward to now… I still wear them. Lol! OK, I have new pairs of Birks, but I wear the old ones around the house. I totally wear my Dead shirts. So I’ll be purchasing a new tshirt from the show this weekend. And I’ll be going with my brother, and Brian to both shows. It’s a historic event, they have not played in twenty years since Jerry Garcia passed away. It’s called the ‘Fare thee Well’ shows, a fifty year anniversary celebration goodbye. I am so happy and grateful to be able to go to these. Music is a huge part of my life, and always has been. While my brother and I are freaking out in excitement, Brian is going to be supportive. How amazing is he? I am so happy!!! Now that has nothing to do with this salad, it has everything to do with what I am doing this weekend. So you know where I’ll be, hippie dancing in the Bay, and enjoying good eat from that area, wearing my Birks. 1. Place olive oil, lemon, honey, salt, and pepper in a jar fitted with tight lid, shake vigorously to combine. 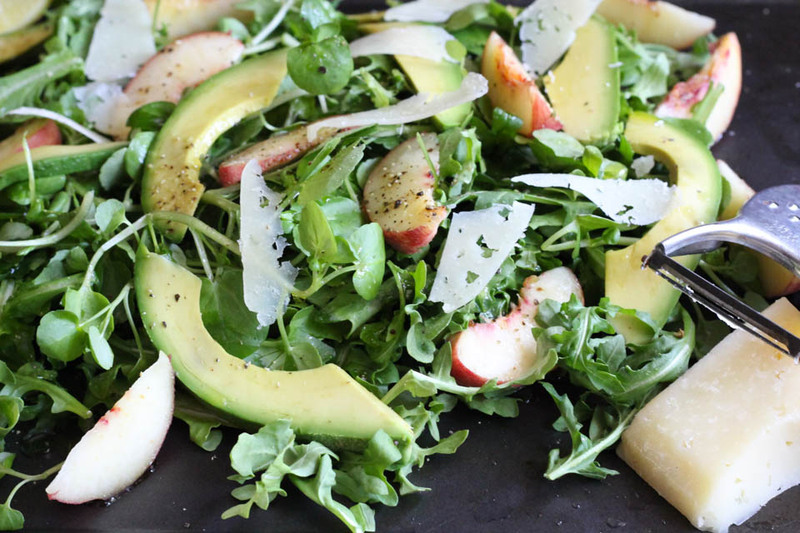 Place arugula or watercress in a large bowl, toss with dressing, leaving a little bit in the jar for the peaches and avocado. About 2 teaspoons. 2. Place arugula or watercress on a large platter to serve. Place sliced peaches and avocados in the bowl where the greens were, add remaining dressing, toss to combine very gently. 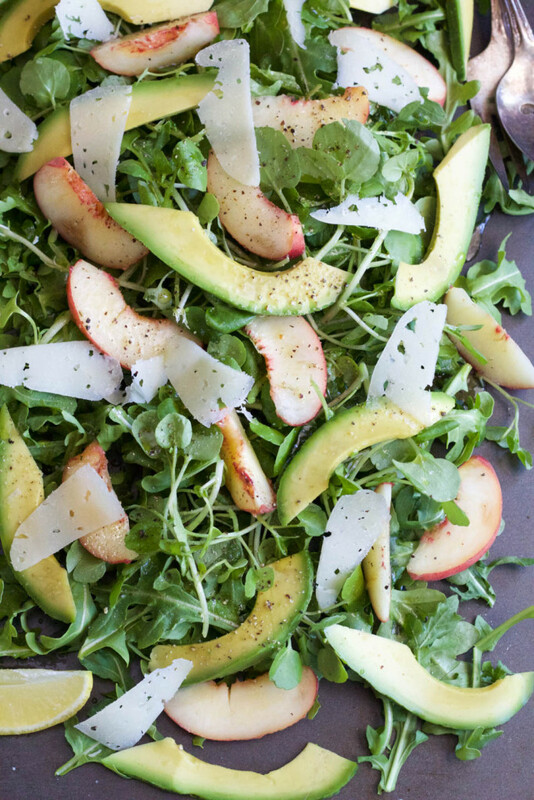 Place fruit on top of the arugula or watercress. Sprinkle cheese over top. Serve immediately. Some of my other favorite salad recipes from NJB! Salad recipes from my blogging friends! Those work as well! 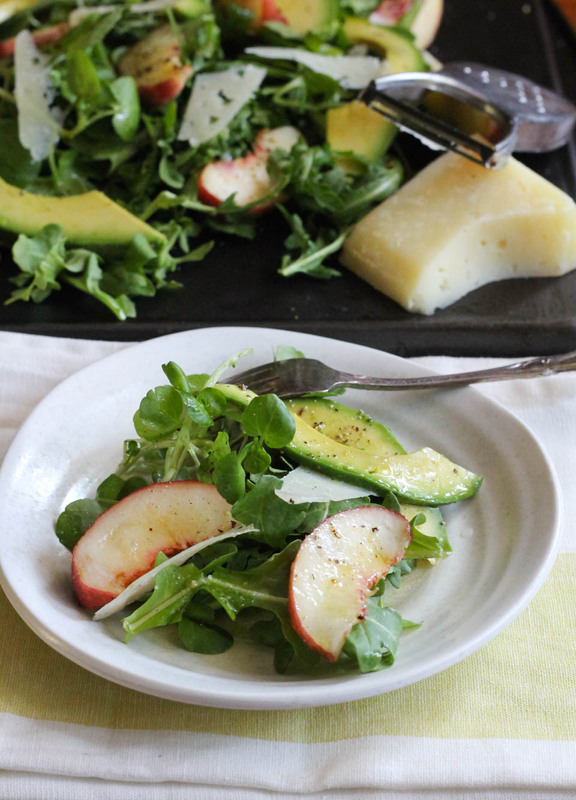 Manchego is the under utilized cheese, and so perfect for salads. I’m with you on the arugula! This combination of flavors totally works for me Fabiola! I love all the fresh flavors and mixed textures in this salad! Peaches, Manchego, and Arugula sound heavenly together. I’m gonna marry this salad! DI-VINE! Ha! Thank you so much! !